We’ve all heard this saying before: Time is money. Plus, we’re all looking to save time and money, right? Well, guess what? If you’re looking for an easy way to maximize your time and cash flow, you’re in luck. A Chime bank account can help you reach your money goals – and fast. What’s not to like about that? No hidden fees and get your paycheck up to 2 days early! To see how you can bank on more time and money, check out these 5 ways Chime can help you #BankFaster. Ready, set, save! Chime members can get paid up to two days early thanks to early direct deposit. * To take advantage of this Chime feature, all you have to do is set up direct deposit with your employer and, well, that’s it! Your paycheck will post to your Chime Spending Account up to two days earlier than traditional banks. Are you ready to start saving money without thinking about it? By signing up for Chime today and opening a Savings Account, you can enroll in Automatic Savings in one click. You’re now on your way to saving money every time you spend on your Chime Visa® Debit Card. 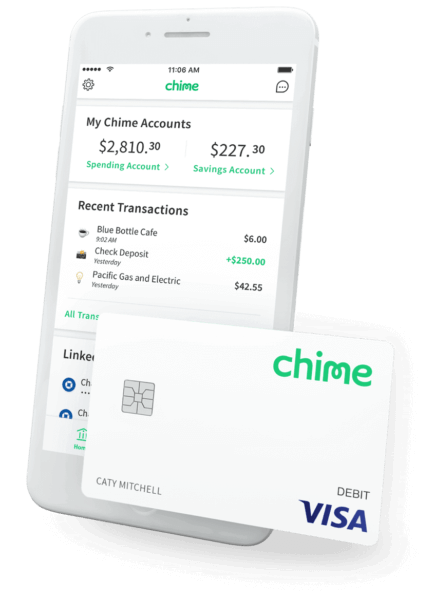 That’s right, every time you pay a bill or make a purchase on your card, Chime rounds up the transaction amount to the nearest dollar and deposits that amount into your Chime Savings Account. Not only that but Chime helps you save money every time you get paid. How? Chime will automatically transfer 10% of your paycheck into your Savings Account. At Chime, you can make instant peer-to-peer payment transfers through our Pay Friends feature. This lets you send money to other Chime members instantly, giving you an easy way to split bills like rent and restaurant tabs. You can say goodbye to divvying up checks and if you forget your cash or credit card, you can pay friends (or receive payment) right through your Chime mobile payment app. And perhaps the best perk? You can send and receive funds in seconds, compared to Venmo transactions which can take up to three days. Chime helps you start the day in the know with a simple balance notification to let you know where things stand with your bank account. The Chime mobile app also sends you real-time transaction alerts. This means you’re the first to know any time there’s a transaction on your account, and you’ll never need to wonder about when or if a deposit was posted to your account. What are you waiting for? It’s time to bank the way you live. #BankFaster with Chime!